Heaping irony upon irony, three weeks after protesters cheered the military for ousting Egypt’s President Mohamed Morsi, the new strongman, General Abdel Fattah al-Sisi called on the people to take to the streets in a show of support for him to defeat “violence and potential terrorism.” And taking the large crowds that gathered in Tahrir Square as a mandate to crush supporters of the democratically elected president, the army launched a massacre of Morsi loyalists at their Cairo sit-in on Saturday 27 June 2013. Much has been written about President Morsi’s overreach for power despite having secured only 51.7% of the vote in a run-off against a factotum of the old regime, Ahmed Shafik, the last prime minister to serve under Hosni Mubarak. But perhaps his biggest failure was not to neutralize the country’s coercive apparatus, laughably called its security services. Though human rights activists had hoped that as Morsi has himself been targeted by the police during his long years in opposition, he would rein in the police, he openly praised the police for its role in the 2011 revolution—a revolution in which uniformed and plain clothes officers had killed over 800 people, just as they killed Morsi’s supporters last Saturday. The military has also been unrepentant about its role under the old regime: as late as June 2011, General al-Sisi justified the “virginity tests” the Supreme Council of the Armed Forces inflicted, among other humiliations, on women demonstrators during the Cairo chapter of the Arab Spring. When television cameras beam pictures of massive crowds in Tahrir Square opposing President Morsi and the Muslim Brotherhood, it is well to remember that in the first round of last year’s presidential elections, the candidate who won a plurality of votes in Cairo and in Alexandria, Egypt’s second city, was neither Morsi nor his opponent in the run off election, but a secular candidate, Hamdeen Sabahi. Long decades of providing social services to poor neighborhoods in Cairo and other cities, and in the rural areas where most Egyptians live has created a massive constituency of support for the Muslim Brotherhood. No democracy can take root in Egypt by excluding them as the military seeks to do with the connivance of the liberals and the West. When secular Egyptians—even radicals like Samir Amin—rejoice at the military’s ouster of a democratically elected president and plaster the general’s photo all across Cairo, they repeat Morsi’s fatal mistake of relying on the army and the police rather than on democratic institutions and protocols. By shutting down Islamists’ media outlets, reviving the secret police, and conspiring to ban the Muslim Brotherhood entirely, the military is fast overturning the gains of the Arab Spring. No future government is safe from military intervention. The coup d’etat against Egypt’s democratically elected government will have resonances far beyond the country’s borders. As the oldest and most influential Islamist movement, the Muslim Brotherhood has affiliates across the Islamic world and while these parties have largely renounced violence, now they could well conclude that violence is the only way to achieve power. After all, previously in 1992, as the Islamists were poised to win an election in Algeria, the army annulled the election. After they are denied office a second time, why should they place their hopes again in the electoral process? An ultraconservative Libyan cleric, Sheikh Mohamed Abu Sibra has already admitted that it has become impossible to persuade militias in Benghazi to lay down their weapons. The interim government imposed by the military is also not going to be able to solve Egypt’s economic problems that also fueled the opposition to the Morsi government. When the tourist industry was in the doldrums and over 40% of the population was living below the poverty level, Morsi ended the food and utility subsidies as demanded by the IMF as the price for a $4.8 billion loan. As prices soared, food became unaffordable and the World Food Program reported that the growth of a third of all children in the country was stunted in 2011. Neither the military nor the interim government it installed is likely to reinstate subsidies and the military which controls 40% of the country’s economy will zealously safeguard its privileges. No future government will dare tamper with the military’s perks. It is a real pity that the so-called emerging powers—China, India, Brazil, and South Africa don’t weigh in on the events in Egypt and leave the West to define an ‘international response’! Democracy, after all, is not the exclusive preserve of the West—and the few governments elected by popular vote in Europe and North America before the Second World War were underpinned by colonial or neo-colonial exploitation of the peoples of Africa, Asia, Latin America, and the Middle East. Democracy is no privileged preserve of any peoples–and the peoples of the world ought to pressure governments everywhere to adhere to democratic norms! Israel’s eight-day assault on Gaza caused enormous damage to the physical infrastructure of that impoverished coastal strip and a vastly disproportionate human toll on the Palestinians. Yet, in a preliminary balance sheet, Hamas is a clear winner. Long shunned by the European Union, Israel, and the United States, it has now emerged as a legitimate player. its rival–the Palestinian Authority–was completely sidelined with its foreign minister forced to visit Gaza with an Arab League delegation! The Palestinian Authority’s President Mahmud Abbas did not visit Gaza at all in contrast to the Egyptian Prime Minister and the Tunisian Foreign Minister. Four years ago, when the Israeli’s had launched their last assault on Gaza, the Palestinian Authority had prevented demonstrations in support of the people of Gaza on the West Bank: this time it could not hold back support for Gaza. It was able to launch rockets to Tel Aviv and Jerusalem that even the more militarily capable Hezbollah had not contemplated when Israel invaded Lebanon. Hezbollah, itself, by continuing to back Syria’s Bashar al-Assad who is engaged in a murderous internal war to retain his position, has also lost considerable legitimacy in the Arab street. Conversely, on this register too, Hamas by distancing itself from the Syrian regime and moving its headquarters from Damascus to Qatar, emerges stronger. In the deliberately ambiguously worded ceasefire negotiated by Cairo and Washington, none of the terms insisted by the Quartet–the US, the EU, Russia, and the United Nations—that Hamas renounce violence and recognize Israel in return for an engagement were mentioned. Instead, the ceasefire agreement accepted, however vaguely, Hamas’ central demands that targeted assassinations of individuals be stopped and that the border crossings be opened to the free movement of goods and people has been accepted. Whether these agreements will be implemented remains to be seen of course. Egypt’s newly elected president Mohamed Morsi has emerged as a key regional power weight. less than 48 hours after the Israeil bombardment, he dispatched his prime minister, Hesham Kandil, to Gaza in a show of support and pointedly condemned Israeli aggression. When the United States continued to unflinchingly support Israel, and refusing to engage Hamas, and with Turkey’s prime minister, Recip Tayyip Erdogan, having cut his ties to Israel, Morsi was the only credible interlocutor capable of negotiating a ceasefire. In fact, emboldened by his role in the Gaza ceasefire, Morsi has flexed his political muscle domestically: conferring on himself extensive powers and immunity from judicial overview. 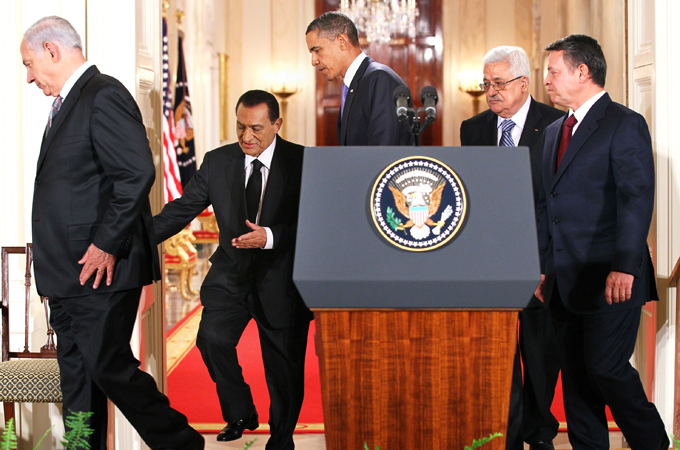 Cementing Hamas’ role as a legitimate regional power has been a defeat for the United States. Once again, as the Israeli assault on Gaza began, President Barack Obama said he “fully supported israel’s right to self-defense” and both houses of Congress passed lopsided resolutions in favor of Israel. Yet, as even the Economist magazine indicated the casualties have been disproportionate. Unable to deal directly with Hamas with which it has no formal engagement, the United States was forced to deal with them through Morsi and thus for the first time in the long history of Israeli occupation of Palestine, the ceasefire was announced in an Arab capital! Israeli Prime Minister Binyamin Netanyahu may have thought that another attack on Gaza, less than two months before an election, would have bolstered support for him. But continued international pressure, and the impossibility of stifling Gaza resistance to Israeli oppression compelled him to agree to a ceasefire. A poll found that more than 70 percent of those polled in Israel were opposed to the ceasefire, signaling possibly that Netanyahu had badly miscalculated his pre-election war strategy. No doubt, the US will fund a large part of the costs of the Israeli assault: each interceptor missile fired by its Iron Dome system costs $62,000 and each of the 5 Iron Dome batteries cost $50 million and it plans to deploy a total of 13 batteries. This cost will undoubtedly be borne by the American taxpayers–given the US Administration and Congress’ unconditional support for Israel. Aid from Qatar and other Arab states–in October 2012, the Emir of Qater was the first head of state to visit Gaza since the tiny coastal enclave was turned into an open air prison by Israel in 2007–will help rebuild its arsenals and the infrastructure, along with of course support from Iran. Moreover, even as Israeli missiles and air-strikes may have devastated its weapons factories and arsenals, by bombing buses, Hamas has reminded Israeli leaders of its extraordinary resilience. In any preliminary assessment of the Israeli assault on Gaza, Hamas and Morsi have emerged as winners, though at a terrible cost to the people of Gaza–another thing that Netanyahu has to answer for. If the revolt in Libya initially followed the script in Tunisia and Egypt, with protestors calling for democracy and the ouster of an autocrat who had ruled over them for long, it was quickly evident that the Libyan story would have its own murderous twists. Colonel Muammar al-Gaddafi had after all supported to the end his fellow autocrats–Tunisia’s Ben Ali and Egypt’s Hosni Mubarak–and urged them to retain their presidencies ‘life.’ And as he had centralized all power and deliberately kept the army weak, there were no generals who could send him packing. It was clear that he was not going to go timidly. 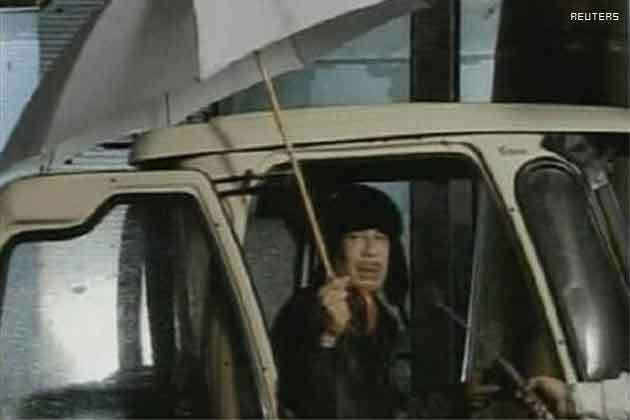 After an initial period of paralysis, when the rebels quickly consolidated their control over the oil-rich eastern parts of the country and began advancing to towards the regime strongholds of Sirte and Tripoli, Gaddafi launched a murderous counter-assault with tanks, heavy artillery, and air planes. The paramilitary forces commanded by his sons were far better equipped that the rebels and the military deserters who had joined them and have been steadily rolling back the rebels. Stopping the rebel advance in Bin Jawad, a small town between the oil refinery port of Ras Lanuf and Gaddafi’s home town of Sirte. The regime’s forces have now captured the ports of Ras Lanuf and Brega and are advancing towards the rebel headquarters of Benghazi, though Misurata in central Libya still appears to be holding out despite assaults by the pro-Gaddafi forces. The fact that demonstrators across North Africa and the Persian Gulf are not chanting anti-Israel or anti-US slogans merely shows that the protests are rooted in domestic conditions, not that they are pro-Israel. Indeed, the demand for accountable governments is a demand for governments not to be subserviently enforcing Israeli policies as Mubarak had done! If the purpose of intervention–even the imposition of a ‘no-fly zone’–is to protect civilians, it reeks of double-standards. Not only have the United States, European leaders, or the Arab League not reacted in a similar manner to the killing of protesters elsewhere–in Yemen, Bahrain, Saudi Arabia, not to speak of Palestinians in the Occupied Territories–but members of the Gulf Cooperation Council and the Arab League are themselves guilty of killing protesters. At the time of writing, Yemeni forces are killing protesters in Sana’a and wounding hundreds elsewhere in the country. While the imposition of a no-fly zone–an act of war and would imply at the very least the bombing of Libyan anti-aircraft defenses–may prevent Gaddafi from launching air raids, Anthony Cordesman, a defense expert at the Center for Strategic and International Studies, believes it will not severely dampen the regime’s counter-assault. It will do nothing to its heavy artillery and its trained paramilitary forces. Arming the rebels poses problems of another order. 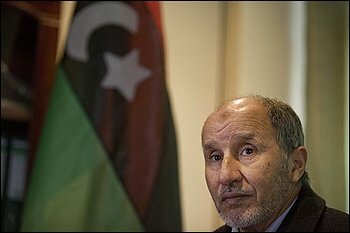 The Libyan National Council is headed by Mustafa Abdul Jalil, a former Justice Minister in the Gaddafi regime but the names and identities of many of its members have not been revealed. They appear to be united only in their opposition to Gaddafi and include the entire spectrum from Islamic fundamentalists to pro-democracy activists and workers and the relative balance between these factions is anything but clear. What is clear is that the rebels have little or no military training and hence it is anything but certain that they can withstand the regime’s counter-assault even if they were provided with arms. 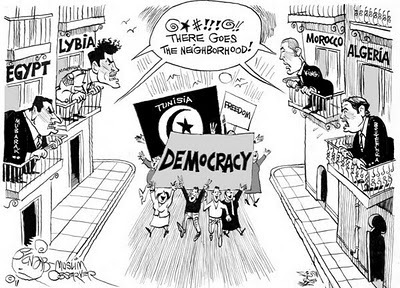 It is also clear that Gaddafi has a powerful constituency, bought off with his oil revenues and tribal loyalties. This inevitably implies that effective intervention on the terms being discussed by the European Union, NATO, and the United States would involve putting US and European forces on the ground. it is not clear how the US can sustain a third war in difficult financial circumstances and the intervention may strengthen Gaddafi’s hands if the Libyans see “French and English speaking troops conducting Iraq War style raids into their homes” as Vijay Prashad has rightly suggested. And any intervention coming on the heels of the US House of Representatives’ Homeland Security Committee hearings on the radicalization of American Muslims will be doubly egregious. Indeed, the autocrats represented in the Arab League and the Gulf Cooperation Council may well have called for the imposition of a no-fly zone to divert attention from the domestic problems fueling the protests back to anti-imperialism! What is additionally noteworthy is that the military government in Egypt has not taken a strong stand against the assault launched by the Libyan regime. Its military, provisioned by the US, its infinitely better equipped than the Libyan forces and yet does nothing to intervene. Rather than supporting the Libyan protestors it does not even help Egyptian workers in Libya get back home! If Gaddafi is able to capture Benghazi, then the tide of Arab rebellions would have been turned especially as the Saudis have allocated $37 billion to buy the loyalty of its people and the Gulf Cooperation Council is channeling $20 billion to Bahrain and Oman to similarly buy off their oppositions. Alternatively, we could see an effective partitioning of Libya into a rebel dominated eastern wing and a Gaddafi controlled west. If this happens the control of oil, mainly located in the east and the very sparsely populated South would be crucial and the stalemate could be prolonged. Reports of four British Special Air Service (SAS) troops being captured 30 kilometers from Benghazi is ominous especially since the rebels they were ostensibly sent to help had no inkling that these troops were being parachuted into the areas they control. The refusal of the Gaddafi regime to crumble in the face of widespread protests–unlike the regimes in Tunisia to its west and Egypt to its east–has meant that the struggle for power in that oil-rich desert state had flared into a full-blown civil war. The ‘prime directive’ if you will of the UN doctrine of “responsibility to protect” is that intervention does no harm–and on these grounds, any intervention in Libya would fail spectacularly! 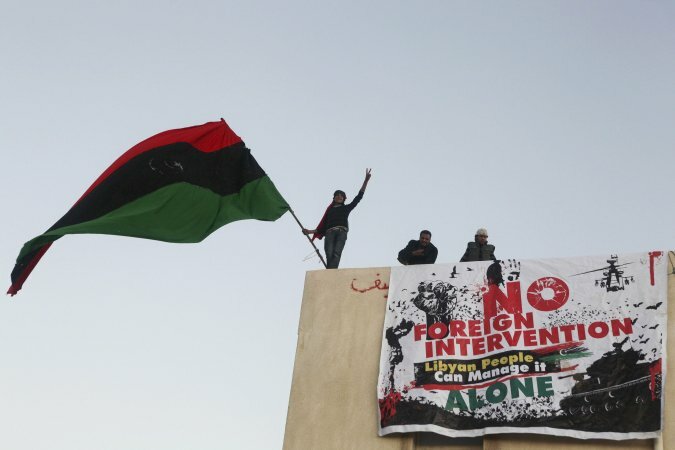 Even some opponents of the Libyan regime have warned against foreign intervention. Certain Russian and Chinese vetoes ensure that there will be no UN Security Council sanction for intervention and that any intervention will be under NATO auspices–or by the US, the UK and some of their allies acting on their own initiative. If there is intervention, it is almost certain that it will have to be followed by an occupation–the opposition is disparate and only united against the regime; it is clear that the regime has some significant support–otherwise it would not have been able to mount an offensive. Since both factions will have access to weapons, an occupation to pacify the country would have to follow. Moreover, for all the talk of Libyan government forces launching murderous assaults against its citizens, the Libyan military has been largely ineffective. 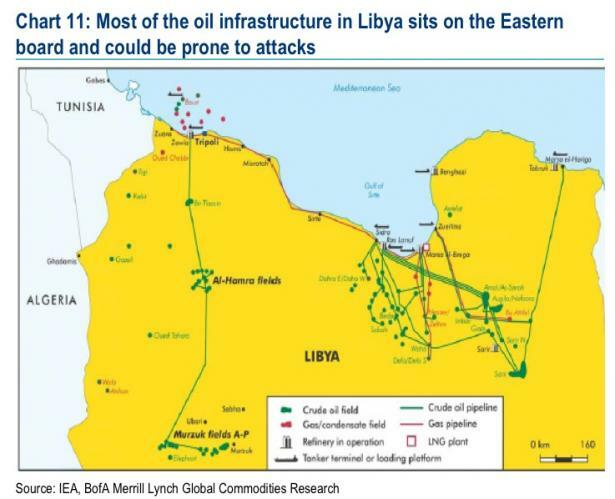 Opposition forces already are reported to control some 80 percent of Libya’s oil supplies. 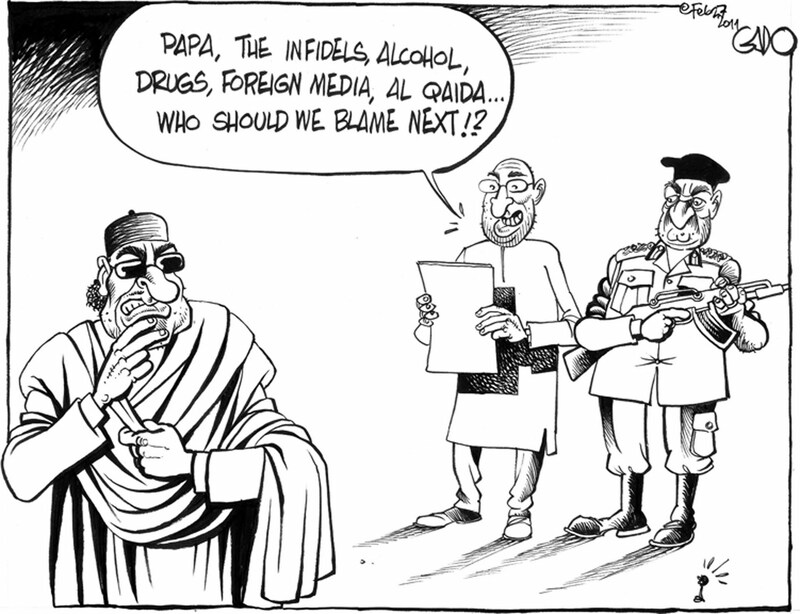 Government planes have been unable to bomb targets–leading to speculation that the sympathies of pilots are with the rebels though it is at least equally plausible that it is because they are poorly trained. Aljazeera English that the strength of the Libyan military is overly exaggerated. Years of sanctions and poor maintenance has meant that much of its military hardware are obsolescent or unusable and it estimates that the regime has only about 10-12 thousand well-trained and well-armed troops. The very weakness of the Libyan forces makes threats of foreign intervention ominous. If US, British or NATO forces can intervene on a pretext, they can establish bases in Libya as they can install another kleptocratic regime–once such bases are established, they take a life of their own and are rarely dismantled as shown by the history of post-Second World War US bases. Libya has the largest oil reserves in Africa and that as world demand for petroleum surges insatiably, there is a greater urgency to control sources of supply. However, Michael Klare has documented that every effort by the UK and the US to control supplies has led to disaster–stretching from the coup d’etat that London and Washington engineered to depose the democratically elected government of Mohammed Mossadeq in Iran in 1953, to the fall of the Shah in 1979, and to the two invasions of Iraq in 1991 and 2003. To site bases that could be used for war against another Arab country would be anathema to the protestors. Riots across North Africa and the Persian Gulf for once is not about imperialism or Israel–but about food and employment, for democracy and dignity, and against corruption and nepotism. Here too Libya is noteworthy in that it has the best Human Development Index among all African states. Here it is a case of the young and the middle class demanding an end to autocracy more than the bread-and-butter struggles that animated the Egyptian revolts and these rebels are not going to tolerate the establishment of another pro-Western kleptocracy. As images of demonstrators in their tens and hundreds of thousands surge all across the capitals of North Africa and the Persian Gulf demanding the ouster of their autocratic rulers, it not only caught the elites in these states flat-footed but also elites in the West who had cosied to, and even propped up, these autocrats to ensure the steady flow of oil, secure the imprisonment of the Palestinians, and as partners in the ‘global war on terror.’ Less that four years ago, Anthony Giddens–former director of the London School of Economics which had accepted £1.5 million from a foundation run by Saif al-Islam Gadafy, the dictator’s son–wrote that Muammar Gadafy is serious about social and political change and that in two or three decades Libya will be the “Norway of North Africa: prosperous, egalitarian and forward-looking.” And even as demonstrators were flocking to Midan Tahrir in Cairo, Vice President Joe Biden could not bring himself to say that President Hosni Mubarak—whom Secretary of State Hillary Clinton called a ‘family friend‘–was a dictator! Yet, the reaction of Western governments to the uprisings in Egypt and Libya could not have been more different–tragedy and farce…or perhaps tragedy repeating as tragedy as Eduardo Galeano adapted Marx’s famous dictum for the Third World. There was no such equivocation as demonstrators took to the streets and squares of Bengazi and Tripoli. Here, almost as soon as protestors took to the streets, the US administration and its European allies–even Italy’s Silvio Berlusconi who had particularly strong ties to the Libyan leader–were quick to call for a regime change, freeze Libyan assets, impose sanctions, call for UN Security Council resolutions condemning Muammar Gafafy, and even speculate on military intervention–to ‘take out’ Libyan air defenses to impose a ‘no-fly zone’ and with Senators John McCain and Joseph Lieberman even advocating the supply of arms to the Libyan opposition. And the Security Council even had the bald-faced temerity to refer Libya to the International Criminal Court which the United States does not even recognize as Seumas Milne noted in the Guardian! Calls to intervene militarily and at least to impose a ‘no-fly zone’ were couched in humanitarian terms, and explicitly because of the Libyan regimes murderous assault on its own citizens. Brutal as the Libyan regime has been, it underlines the hypocrisy of the West that the weapons used by the Libyan government forces were supplied by these very Western powers and that in the present upheavals in Libya, Gadafy’s forces have killed far fewer people than Israel did in Gaza in early 2009 just before the George W. Bush Administration left office as Pepe Escobar wrote in AsiaTimes Online. And as the protests were gathering steam in Libya, the Afghan government found that NATO forces had killed 65 civilians including 40 children in the eastern Kunbar province, a fact conveniently ignored in the shrill outrage over Gadafy’s brutality! And of course the US occupation forces in Iraq and Afghanistan do not even keep a tally of the civilians killed there in one of the greatest war crimes of recent history. The disparity between Western responses to uprisings in Egypt and Libya are partly due to the nature of the two regimes. The Mubarak regime is central to the continued oppression of the Palestinians–they have been collaborators in the incarceration of Palestinians in Gaza by the Israel’s gruesome blockade to punish the residents for electing Hamas–so much too for Western advocacy of democracy: elect our puppets or we will wreak havoc on your house is the message from Washington and the European capitals! The Egyptian armed forces had, as a result, not only got many billions in aid from the US, but its senior leadership had developed close ties with the American military. Military leaders in Egypt had also profited handsomely from the Mubarak regime. Since reporting on the Egyptian military is a crime, the extent of its economic holdings are unclear and estimates of its share of the national economy range from 5 to 40 percent. General Sayed Meshal, former head of the Ministry of Military Production claimed that it employed 40,000 civilians and took in about $345 million a year. The popular uprising, the people’s revolution, provided them a convenient cover to derail Mubarak’s plan to anoint his son as his successor and by assuming charge of the country, the Supreme Council of the Armed Forces can be expected to safeguard their own privileges, prerogatives, and powers. There was no Libyan counterpart to the Egyptian army. Having come to power in a military coup himself, Muammar Gadafy was quick to ensure that there was no other power center to challenge his rule. His sons and other family members controlled powerful militias that were better equipped than the regular army and he carefully cultivated the top brass of the air force. There were no comparable links between the US and Libyan militaries. Here the powerful militias and the Libyan elite were directly tied to Gadafy and without him, their power, privilege, and prerogatives would evaporate. Unlike Tunisia–where also the West-supported autocrat, Zine el-Abidine Ben Ali was sent packing by a popular protest–and Egypt, Libya has oil. Unrest in North Africa and the Persian Gulf has already pushed up oil prices and since 85 percent of Libya’s oil exports are directed towards Europe, a continued spike in oil prices would threaten Eurozone economies already buffeted by credit crises in Portugal, Ireland, Greece, and Spain. If NATO can intervene in Libya, and install a pro-Western post-Gadafy government, it will not only ensure Europe’s oil supplies but provide Israel with additional security. And NATO forces will have easy access to, and oversight over, the 4,128 kilometer Trans-Saharan pipeline from Nigeria to Algeria scheduled to be operational in 2015. What is also troubling in all this is that the so-called emerging powers–India, Brazil, South Africa–have been deafeningly silent. The stage of global politics, it seems, is still reserved for the North Americans and the Europeans–though fortunately the Russians and the Chinese may be counted on to bloc any UN endorsement of military action by NATO forces. If ever there was an opportunity to mediate in the crisis in Libya, it is the Arab League and the African Union that should take the lead–and indeed, it is Venezuelan President Hugo Chavez who has offered his services to the Arab League to mediate the crisis.